Monday and yesterday I was busy working on the dining room. There’s still plenty that needs to be done, such as putting trim back up around the door to the garage – we had to remove it when we took the paneling off because the paneling was underneath it. 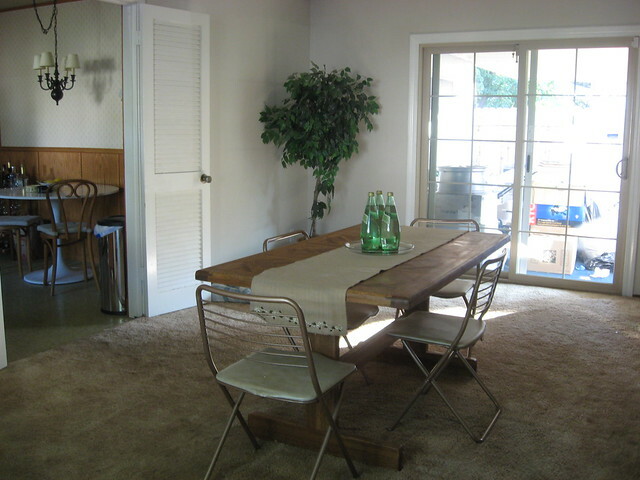 I’d also like to get some actual dining chairs and possibly a bench. One of my biggest annoyances about this room is the fact that the spot for ceiling lighting is not in the center of the room. So even though the dining room table is in the center of the room, the light is not. I have to fight with either having table being off so the light is under the table or having the table centered (like you can see above) and the light being off. I can’t decide. I also didn’t anticipate having my EKTORP sofa in there; originally it was going to go on the back patio, but I don’t want it to get bug infested. I’m seriously thinking about selling it because I really don’t have any need for it now that I’ve inherited the super comfy sofa and matching loveseat from my Nana. I don’t know yet. 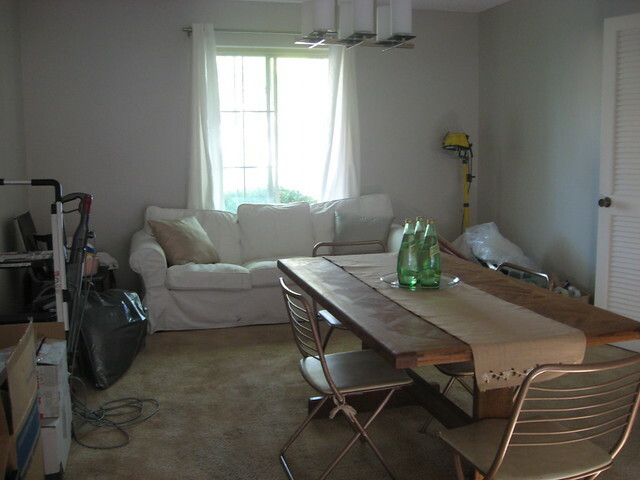 I’m satisfied with how this side of the room turned out, although it’d be nice to have a clean patio to look at, haha. At Christmas time I’m going to put my Christmas tree in that corner where that other fake tree currently resides. Joshua and my mom think the doors to the patio could use curtains of some sort, but I personally like how it is. The trim around the door is thicker and a bit more decorative than the rest of the trim, so I think it’s a nice accent.